Amazon is selling Colgate Herbal Toothpaste 200 g (Pack of 2) plus Colgate ZigZag Black Medium Tooth Brush (Pack of 5) at Rs 191. It is a very good deal. SO, hurry up!! So, Hurry up!! 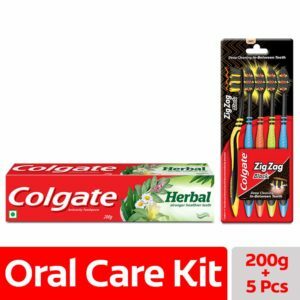 How to buy Colgate Herbal Toothpaste 200 g (Pack of 2) plus Colgate ZigZag Black Medium Tooth Brush (Pack of 5) at Rs 191?